Celebrate Labor Day with Stonefire! Labor day marks the end of the summer season and the start of a Fall. Thankfully, we always get to have one last hurrah of summer with the long Labor Day weekend. One “last hurrah of summer” is typically the way most of us think of the Labor Day weekend, but what if we thought of it as a “new beginning” rather than “the end of summer”? When you stop and think about it, it really IS a transitional weekend; we’re transitioning from the relaxed pace of summer to the busier pace of fall with the start of a new school year and fall sports. Here’s some great ideas for Labor Day menu items that will also serve as great “go to” meals for your family during the busy start of a new school year! 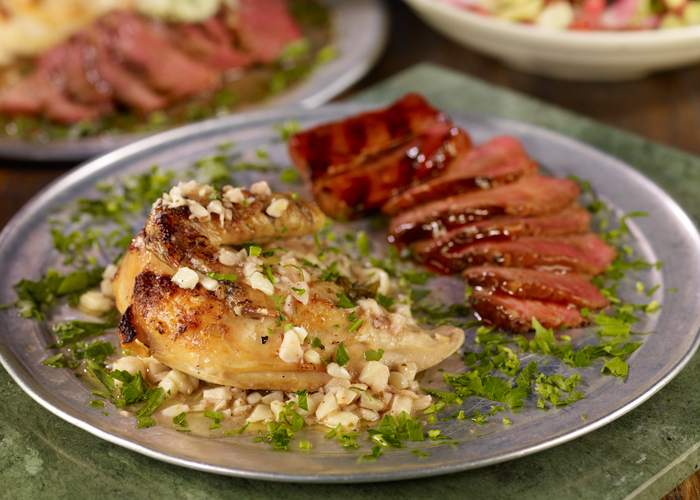 These are some of our Stonefire favorites and ones your entire family will love too! Easing into a new school year means finding a routine that works with your new schedule. We have introduced a new Family Meal to take making dinner off your to do list. Our ½ Chicken and ½ Tri Tip meal includes a choice of Lemon Garlic or Mesquite BBQ Chicken, Pepper Garlic or Mesquite BBQ Tri Tip, a medium salad (choose from Greek, Cartwheel, Caesar or Garden) and 12 breadsticks. To complete the meal, add on a 12” two-topping pizza or 2 medium sides! With the re-introduction of the fall season, we have also re-introduced the Stimulus Package! Our Stimulus Package is back with all of your favorites, all for $24.99. Enjoy a whole chicken or half tri tip, a small salad (choose from Garden, Cartwheel, Caesar or Greek), a 12” two-topping pizza and 8 Freshly Baked Breadsticks. Both of our new Family Meals are perfect for 4 or more people and will help make the transition from summer to fall a little easier for you; because really, that’s what the Labor Day holiday is: a great way to mark the start of a new season! New Stimulus Package: Perfect for Four People!